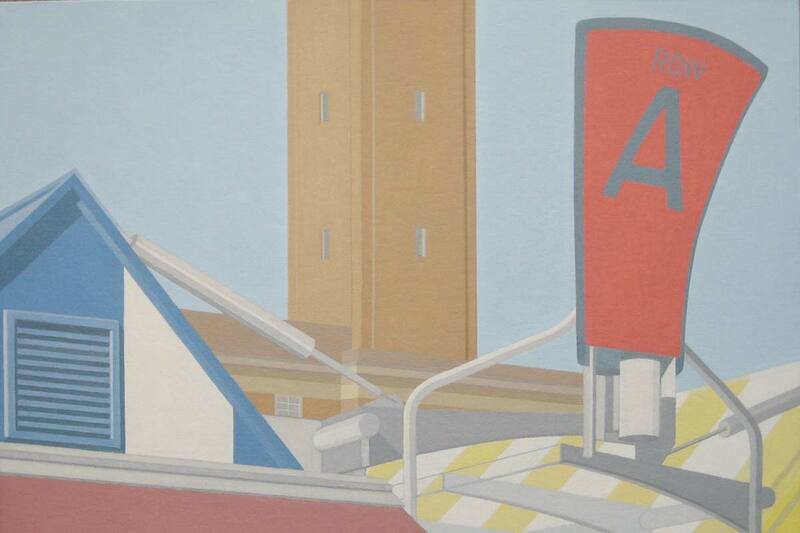 Former architect Jeremy Taylor is exhibiting a set of 48 paintings online via Mandell’s Gallery, Norwich. Jeremy, who lives in Norwich, trained as an architect at the University of Cambridge and then studied the architecture of the USA. He worked in architectural practices in both Cambridge and London, later moving to undertake research at the University of York. He has written and illustrated books and articles on architecture and architectural history. The paintings being exhibited explore the essence of architectural design, often focusing on parts of buildings and structures to draw attention to detailed geometries and to the architect’s creativity. Colour is an important aspect and is used to emphasise the visual qualities of the forms and the contrasts portrayed. The preferred medium for most of the paintings is acrylic on canvas board, allowing for a precision that parallels that used during the design process. The pictures can be viewed online on the Mandell’s Gallery website.